In this May 23, 1994, file photo, a Rwanda Patriotic Front (RPF) rebel walks by the the site of a April 6 plane crash which killed Rwanda's President Juvenal Habyarimana in Kigali. 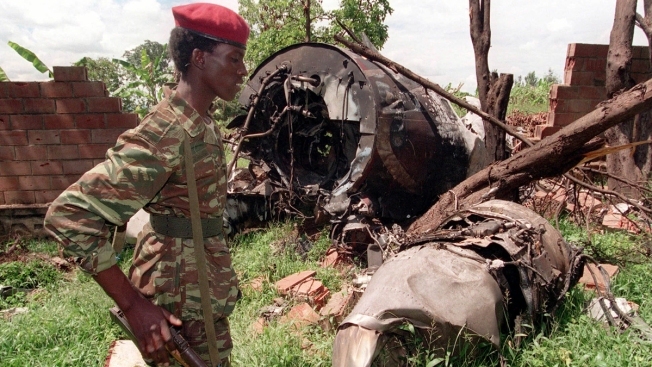 French authorities have dropped a sensitive, long-running investigation into the plane crash that sparked Rwanda's 1994 genocide, citing lack of sufficient evidence. Several people close to Rwanda's current president, Paul Kagame, had been under investigation in the case. The cause of the crash has been a contentious issue. The plane had a French crew, and Rwanda has long accused France of complicity in the genocide, which France denies. French authorities have dropped a sensitive investigation into the plane crash that sparked Rwanda's 1994 genocide, citing lack of sufficient evidence. The Rwandan government praised the definitive end of what it called a "politically motivated investigation." "We welcome this decision which brings to an end a brazen attempt over two decades to obstruct justice for the genocide against the Tutsi, and prevent accountability for both the perpetrators and their wilful accomplices," Foreign Minister Dr. Richard Sezibera said in a statement. Associated Press writer Ignatius Ssuuna contributed.